ABC’s hit fantasy drama ONCE UPON A TIME returns tonight with a brand new episode called, “In the Name of the Brother.” On tonight’s show afraid that the stranger may have seen magic before his accident, some of the Storybrooke residents want Dr. Whale to let him die so that he cannot expose their true identities to the wold, and Victor tries to prove to his father that he can bring back the dead. Did you watch last week’s winter premiere episode? We did and we recapped it here for you! On last week’s show Mr. Gold found an unwilling test subject to see if a spell he has concocted will allow him to cross the border of Storybrooke — without losing his memory — and go in search of his son, Bae; Belle stumbled upon a vengeful Hook in the Storybrooke harbor whose main goal was to eradicate Rumplestiltskin; and Mary Margaret and David go house hunting in search of a bigger place to live. Meanwhile, in the fairytale land that was, Belle met Mulan as the two set out to slay a fearsome beast called the Yaoguai, who had been ravaging the land. Tonight’s episode 12 is going to be exciting, and you won’t want to miss it. So be sure to tune in for our live coverage of the season 2 episode 12 of Once Upon A Time — tonight at 8PM EST! While you wait for our recap, hit the comments and let us know how your excited you are about Once Upon A Time being back! Check out some pictures and a sneak peek of tonight’s episode below! There’s a car wreck at the border of Storybrooke. Hook’s been hurt by the car – his ribs are broken. Gold attacks anyway. Emma and Charming ask him to stop – he says Belle doesn’t remember him and they tell him murder is a bad first impression. Snow, Emma and Charming are flummoxed that someone has driven into Storybrooke. At the hospital, Dr. Frankenstein is boozing it up and reminiscing on the good old days. It’s Christmas and their Father is giving them gifts. His brother gets a watch. He gets a commission bought for him to the Army. He and his brother both argue that his scientific work should take precedence. Victor’s brother tries to give him the watch to fund his work. He refuses but there’s Gold watching him go. There’s chaos in the ER. Belle’s been shot, Hook’s been hit by the car and the driver was injured as well. In Belle’s room, Gold is hovering and sweetly kisses Belle. She wakes and is terrified, screaming. He apologizes and leaves, flustered. In Hook’s room, Emma sits at bedside. She wants to know where Cora is. He’s in loads of pain, but Emma’s not sympathetic. He tries to flirt and she threatens to make him hurt more. She springs – he flinches and aches. He wants his hook back and insists he doesn’t know where Cora is. He tells her he hurt Rumple’s heart – he says Belle is just where he keeps it. Emma tells him he’s chained to the bed and hurt and Rumple is walking free with magic. She tells him he has her vote for dead guy of the year. The newcomer is Greg Mendel. Emma’s checking his phone for photos and they think he’s ordinary. Red and the others are terrified that he might be a random person who just came to town. They need to find Regina, but Red can’t sniff her out. Victor tells them that the new guy is drowning into his chest cavity and is sure to die. Victor pleads with Gold to heal the new guy. He tells the assembled folk he doesn’t owe them anything and most of them owe him. He tells them all that the driver saw him do magic and they should hope that he dies. Victor says letting him die is easy. They decide to discuss it in secret. Flashback to Victor packing up his lab when Rumple shows up. He tells him he’s interested in Victor’s work – he tells him he’s been shut down and can’t bring back loved ones from the dead. Rumple tells him the witchcraft there is weak – in his land, magic is strong. He dumps out an ever-growing bag of gold coins at his feet. Rumple says if he teaches him his knowledge, he can have all the money. Victor agrees and Rumple is gone. Igor shows up and Victor tells him they’re staying and they need a body. At Gold’s shop, a case appears. And then Cora is there! He tells her he hoped she was dead. She tells him she brought him a gift – she tells him it’s a peace offering. He asks what she wants for it and Cora says she wants her daughter back. She tells him she’ll give him his son. He wants to know if she has any spells to return memories and she says she only knows what he taught her. She calls him Master and they shake on a truce. She kisses him to seal the deal. The Doc is staring at the patient’s watch. Charming wants to know why he hasn’t scrubbed into surgery yet. Victor tells him he’s not drunk. Charming says we don’t let people go just because of what they saw. Doc goes back to contemplating the watch. Flashback to Victor digging up a body. His brother finds him in the graveyard and he’s disgusted. Suddenly there’s someone firing at his brother because he’s in uniform. In the carriage, Victor realizes his brother is dying. Greg’s phone won’t stop ringing. Emma and the crew debate answering it or not. The orderly comes out look for the Doc – he never came to the OR. They page him and find his phone and pager left behind. He’s gone! He never even went into surgery. Doesn’t look good for the dying newcomer Greg. Red sniffs Victor’s lab coat and takes off tracking him. Charming tells them the Doc hasn’t been right since he resurrected Regina’s love Daniel who then had to be put down. Flashback to Victor trying to resurrect his dead brother. He and Igor are in the lab trying desperately. They cut upon his chest and find his heart was burned up in his chest like coal. His Father stalks into the lab and sees Gerhard dead on Victor’s slab. He tells him it was an accident. His Father is furious. His Father declares both of his sons dead and stalks out. In the now, Cora is poking around Regina’s house, sniffing her clothes and looking at photos of her and Henry. She finds little mementos that Henry made for her daughter. Henry heads into the crypt and calls to his mother. She hears him in her hideout and opens the secret door to let him in. He hugs her and she tells him she misses him. He tells her he never believed she hurt Archie. She asks how he knew and in a puff of purple magic smoke, Henry transforms into Cora who says she knows because she was the one who did it. Regina is shocked! Flashback to Victor’s lab – he’s got Gerhard in a tank bubbling away. Rumple shows up and asks if it works. Victor tells him the heart failed. Rumple tells him in his land there are magic hearts that can withstand anything. He tells him he’s going to send a friend with a magic hat who will take him to a woman named Regina who can give him a magic heart for his brother. Regina wants to know how Cora got there. Cora tells her she knows why she pushed her through the looking glass and tried to kill her. She tells Regina she loves her but has always shown it in the wrong ways. She says she never should have made her marry the King. Regina accuses her of framing her for Hopper’s death. Cora said she had to show her what the town people really thought. Regina said of course because Cora made it air tight. Regina wants to take Cora to town for a confessional. Cora asks if she does it, can they start over. Cora agrees. At the waterside, the Doc holds the watch. Red finds him and he yells for her to go away. He tosses the watch in the water and starts to jump in, but Red zips to him wolf-fast and grabs him before he plunges in. Flashback – Victor is back with a magic heart for his brother. He shows his Father that he’s brought Gerhard back. His Father is thrilled. He brings a candle closer to see him and Gerhard flinches from the flames. His Father is furious and says the resurrected Gerhard is a monster and Victor is a witch doctor – he begins beating Victor and Gerhard attacks his Father. Victor watches dispassionately and finally tells him to stop, but not until he’s killed him. Gerhard flees. Victor confesses to Red. He tells her Rumple always told him magic has a price – he says science does too. He tells her every time he saves a life, someone loses one. She tells him she’s a werewolf who ate her boyfriend. She tells him that Regina erasing their memory may not have been a bad thing. She says they should both take advantage of their fresh starts. Red tells him someone keeps calling for the guy at the hospital. She encourages him to fix him. Regina and Cora drive into town and Regina asks if she’s nervous. She says she’s uncomfortable in the modern car. She acts like there’s something under her and pulls out the handprint Henry made for her. Regina is angry because she knows Cora was in her house. Cora tells Regina she doesn’t want the love of the town folk and asks what she really wants. Regina says she wants her son back and Cora says she wants her daughter back. Cora promises to do better. She says together they can get Henry back. Regina collapses into her mother’s arms and asks how. Cora says she has a few thoughts. Great! None of them good, I’m sure. Back at the hospital, Victor tells them not to worry – says he was just stretching his legs. He and Red share a knowing smile and he heads into the ER. Flashback – Victor is explaining to Gerhard that he was trying to bring him back. Gerhard attacks but then stops himself and says Victor’s name. He crawls away into a corner and holds his head in his hands. Victor pulls out a pistol and holds it to his brother’s head. He can’t do it. He lowers the gun, but Gerhard grabs it and holds it to his own head. Victor says he won’t do it – says he can find a way. He locks Gerhard in a cell and leaves him there. In the now, Victor tells Red he saved Greg. He thanks her – monster to monster. 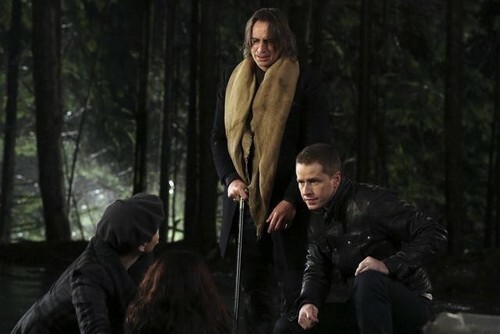 He tells Charming and the others that he’ll be okay with a few weeks of recovery. They all want to talk to him. Emma tells them she’s doing it alone. She says other sheriff’s don’t bring their parents with them. Gold brings Belle the little cup – Chip. He tells her she dropped it in his castle because she was afraid she’d made him mad. He tells her it’s magic. She tells him to go away, take the cup and quit talking about magic. Belle throws and shatters the cup and tells him to go. He tells her he’s sorry and leaves. He seems as shattered as the little tea cup. Emma comes in to see the mysterious Greg who calls her a nurse – she clarifies that she’s the sheriff. She tells him she has his personal effects and puts them on the table. He’s terrified because he knows he hit someone. She tells him the damage wasn’t major and not to worry. Emma asks him exactly what happened. Turns out he didn’t see the magic – he was texting. He said he looked down and when he looked up, the guy was just there that he hit. She tells him she’ll let him go with just a warning. He thanks her and says he’ll head home as soon as possible. Emma tells the others he saw nothing and everyone is relieved. Back at Gold’s he unpacks the weird white globe Cora brought him. He pricks his finger on the top of it and puts a drop of his blood on it. It pulls up a world map – I assume it shows where his son is. At the house, Henry wants to know what happened. They tell him Rumple and Hook had a huge fight, Belle was shot and Dr. Frankenstein saved him. He tells them Frankenstein wasn’t in their story. He muses that if the spell went to other lands, there’s no telling who else is in town. Gold knocks on their door and tells Emma he’s there to claim the favor she owes him. He wants her to go with him to find his son. He says every minute he stays in town is another minute he wants to kill Hook. He also tells them if anything happens to Belle while he’s gone, he’ll punish them all. Back at the hospital, Greg calls his wife, tells her he was in an accident and that he’s okay. He tells her she won’t believe what he saw! He saw the magic!!!! !